Surface anatomy of the left hand. A is the dorsum of the left hand, and B is the palm of the left hand. Number 1 is the position of the extensor retinaculum, 2 is the position of the flexor retinaculum, 3 is the position of the head of the metacarpals, 4 is the ulnar artery, 5 is the radial artery, 6 is the level of the deep palmar arch, and 7 is the level of the superficial palmar arch. As previously mentioned, a total of 27 bones constitute the basic skeleton of the wrist and hand. These are grouped into carpals, metacarpals, and phalanges (see the image below). Bones of the left hand. A is the dorsal view, and B is the palmar view. Number 1 is the radius, 2 is the ulna, 3 is the scaphoid, 4 is the lunate, 5 is the triquetral, 6 is the pisiform, 7 is the trapezium, 8 is the trapezoid, 9 is the capitate, 10 is the hamate, 11 is the metacarpal bones, 12 is the proximal phalanx, 13 is the middle phalanx, and 14 is the distal phalanx. The wrist is the most complex joint in the body. It is formed by 8 carpal bones grouped in 2 rows with very restricted motion between them. From radial to ulnar, the proximal row consists of the scaphoid, lunate, triquetrum, and pisiform bones. In the same direction, the distal row consists of the trapezium, trapezoid, capitate, and hamate bones. All carpal bones participate in wrist function except for the pisiform, which is a sesamoid bone through which the flexor carpi ulnaris tendon passes. The scaphoid serves as link between each row; therefore, it is vulnerable to fractures. The distal row of carpal bones is strongly attached to the base of the second and third metacarpals, forming a fixed unit. All other structures (mobile units) move in relation to this stable unit. The flexor retinaculum, which attaches to the pisiform and hook of hamate ulnarly and to the scaphoid and trapezium radially, forms the roof of the carpal tunnel. The hand contains 5 metacarpal bones. Each metacarpal is characterized as having a base, a shaft, a neck, and a head. The first metacarpal bone (thumb) is the shortest and most mobile. It articulates proximally with the trapezium. The other 4 metacarpals articulate with the trapezoid, capitate, and hamate at the base. Each metacarpal head articulates distally with the proximal phalanges of each digit. The hand contains 14 phalanges. Each digit contains 3 phalanges (proximal, middle, and distal), except for the thumb, which only has 2 phalanges. To avoid confusion, each digit is referred to by its name (thumb, index, long, ring, and small) rather than by number. The skin that covers the dorsum of the hand is greatly different from the skin that covers the palm (see the image below). The skin of the dorsum of the hand is thin and pliable. It is attached to the hand's skeleton only by loose areolar tissue, where lymphatics and veins course. This fact explains why edema of the hand is manifested predominantly at the dorsum. In addition, this loose attachment of skin makes the dorsum of the hand more vulnerable to skin avulsion injuries and also permits the creation of local flaps. The skin of the palmar surface of the hand is unique, with characteristics for special function. The palmar skin is thick and glabrous and not as pliable as the dorsal skin. It is strongly attached to the underlying fascia by numerous vertical fibers. These features enhance skin stability for proper grasping function. 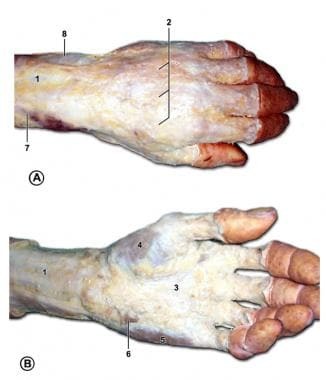 The skin is most firmly anchored to the deep structures at the palmar creases; this is of clinical importance when planning surgical incisions, to minimize skin contractures. In contrast to the dorsal skin, the blood supply to the palmar skin is through numerous small, vertical branches from the common digital vessels. Therefore, the elevation of palmar skin flaps is limited. Finally, the skin of the palmar surface of the hand contains a high concentration of sensory nerve organs essential to the hand's normal function. The nails are specialized skin appendages derived from the epidermis. The nail bed has a germinal matrix, sterile matrix, and hyponychium. Ninety percent of the nail plate is produced by the germinal matrix, which approximately corresponds to the lunula (pale semicircle in proximal nail bed). This germinal matrix starts proximally at the base of the distal phalanx just distal to the insertion of the extensor tendon. The sterile matrix is distal to the lunula; it is very vascular, which accounts for the pink color. The sterile matrix produces 10% of nail plate volume and adds squamous components, which make the nail stronger and adherent to the nail bed. The hyponychium is the distal part of the nail bed; its abundance of immune cells and adherence to the distal nail plate help the nail to resist infection. The palmar fascia consists of resistant fibrous tissue arranged in longitudinal, transverse, oblique, and vertical fibers. The longitudinal fibers originate at the wrist from the palmaris longus tendon, when present. These fibers spread out to the base of each digit, where minor fibers extend distally and attach to tissues. This arrangement of fibers forms the fibrous flexor sheath and pulley system of each digit (see the image below). Subcutaneous structures of the left hand. A is the dorsum of the left hand, and B is the palm of the left hand. Number 1 is the deep antebrachial fascia, 2 is the superficial fascia and dorsal venous network of the hand, 3 is the palmar aponeurosis, 4 is the thenar muscles, 5 is the hypothenar muscles, 6 is the palmaris brevis, 7 is the cephalic vein, and 8 is the basilic vein. The vertical fibers of the palmar fascia attach to the dermis of the palmar skin. Deep to the longitudinal and transverse fibers, the vertical fibers coalesce into septa and attach to the metacarpals, forming 8 different compartments for the flexor tendons and neurovascular bundles of each digit. A common central compartment is located proximal in the palm. The digits contain 2 fascial bands of clinical importance. 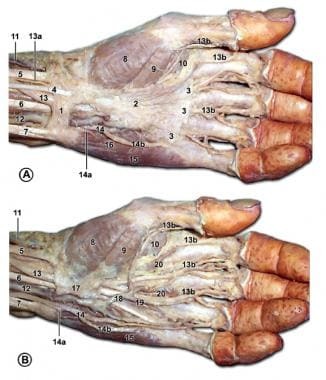 These are the Grayson ligament and the Cleland ligament, which are located volar and dorsal to the neurovascular bundle of each digit, respectively. Knowledge of the anatomy of the palmar fascial fibers and deep compartments is crucial for identification of structures during procedures like palmar fasciectomy for Dupuytren disease. As previously mentioned, the hand is innervated by 3 nerves: the median, ulnar, and radial. Each has sensory and motor components. Variations from the classic nerve distribution are so common that they are the rule rather than the exception. The skin of the forearm is innervated medially by the medial antebrachial cutaneous nerve and laterally by the lateral antebrachial cutaneous nerve (see the image below). Palmar structures of the left hand. In A, the flexor retinaculum is removed. In B, the flexor retinaculum is intact. Number 5 is the flexor carpi radialis, 6 is the flexor digitorum superficialis, 7 is the flexor carpi ulnaris, 8 is the abductor pollicis brevis, 9 is the flexor pollicis brevis, 11 is the radial artery, 12 is the ulnar artery, 13 is the median nerve, 13B is the digital branches of median nerve, 14 is the ulnar nerve, 14A is the deep branch of the ulnar nerve, 14B is the digital branch of the ulnar nerve, 15 is the abductor digiti minimi, 16 is the flexor digiti minimi, 17 is the flexor retinaculum, 18 is the superficial palmar arch, 19 is the common palmar digital artery, 20 is the lumbricals, 21 is the flexor digitorum profundus, 22 is the opponens pollicis, and 23 is the opponens digiti minimi. Proximal to the wrist, the palmar cutaneous branch provides sensation at the thenar eminence. As the median nerve passes through the carpal tunnel, the recurrent motor branch innervates the thenar muscles (abductor pollicis brevis, opponens pollicis, and superficial head of flexor pollicis brevis). It also innervates the index and long finger lumbrical muscles. Sensory digital branches provide sensation to the thumb, index, long, and radial side of the ring finger. At the hand, the superficial branch forms the digital nerves, which provide sensation at the small finger and ulnar aspect of the ring finger. The deep motor branch passes through the Guyon canal in company with the ulnar artery. It innervates the hypothenar muscles (abductor digiti minimi, opponens digiti minimi, flexor digiti minimi, and palmaris brevis), all interossei, the 2 ulnar lumbricals, the adductor pollicis, and the deep head of the flexor pollicis brevis. At the proximal forearm, the radial nerve divides into the superficial and deep branches. The deep posterior interosseous branch innervates all the muscles in the extensor compartment: supinator, extensor carpi radialis brevis, extensor digitorum communis, extensor digiti minimi, extensor carpi ulnaris, extensor indicis proprius, extensor pollicis longus, extensor pollicis brevis, and abductor pollicis longus. The superficial branch provides sensation at the radial aspect of the dorsum of the hand, the dorsum of the thumb, and the dorsum of the index finger, long finger, and radial half of the ring finger proximal to the distal interphalangeal joints. Muscles and tendons of the dorsum of the left hand. Number 1 is the extensor retinaculum, 2 is the extensor carpi ulnaris, 3 is the abductor digiti minimi, 4 is the extensor digiti minimi, 5A is the extensor carpi radialis brevis, 5B is the extensor carpi radialis longus, 6 is the extensor digitorum, 7 is the extensor indicis, 8 is the extensor pollicis longus, 9 is the extensor pollicis brevis, 10 is the first dorsal interosseus, 11 is the extensor expansion, 12 is the intertendinous connections, 13 is the abductor pollicis longus, 14 is the radial artery, and 14A is the princeps pollicis artery. The extensor carpi radialis brevis (ECRB) is the main extensor of the wrist, along with the extensor carpi radialis longus (ECRL) and extensor carpi ulnaris (ECU), which also deviate the wrist radially and ulnarly, respectively. 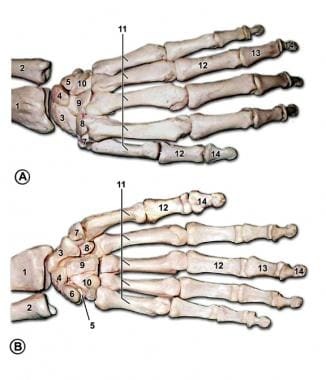 The ECRB inserts at the base of the third metacarpal, while the ECRL and ECU insert at the base of the second and fifth metacarpal, respectively. The extensor digitorum communis, extensor indicis proprius, and extensor digiti minimi extend the digits. They insert to the base of the middle phalanges as central slips and to the base of the distal phalanges as lateral bands. The abductor pollicis longus, extensor pollicis brevis, and extensor pollicis longus extend the thumb. They insert at the base of the thumb metacarpal, proximal phalanx, and distal phalanx, respectively. The extensor retinaculum prevents bowstringing of tendons at the wrist level and separates the tendons into 6 compartments. The extensor digitorum communis is a series of tendons to each digit with a common muscle belly and with intertendinous bridges between them. The index and small finger each have independent extension function through the extensor indicis proprius and extensor digiti minimi. The extrinsic flexors consist of 3 wrist flexors and a larger group of thumb and digit flexors. They are innervated by the median nerve, except for the flexor carpi ulnaris (FCU) and the flexor digitorum profundus to the small and ring finger, which are innervated by the ulnar nerve (see the image below). 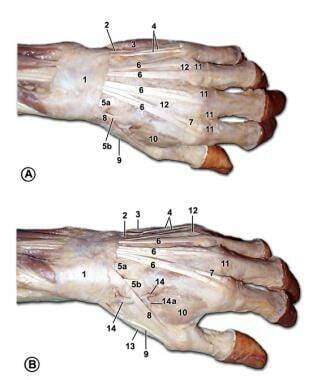 Palmar structures of the left hand. In A, the palmar aponeurosis is intact. In B, the palmar aponeurosis is removed. 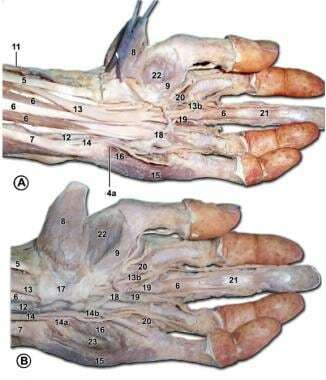 Number 1 is the deep antebrachial fascia, 2 is the palmar aponeurosis, 3 is the superficial transverse metacarpal ligaments, 4 is the palmaris longus, 5 is the flexor carpi radialis, 6 is the flexor digitorum superficialis, 7 is the flexor carpi ulnaris, 8 is the abductor pollicis brevis, 9 is the flexor pollicis brevis, 10 is the adductor pollicis, 11 is the radial artery, 12 is the ulnar artery, 13 is the median nerve, 13B is the digital branches of the median nerve, 14 is the ulnar nerve, 14A is the deep branch of the ulnar nerve, 14B is the digital branch of the ulnar nerve, 15 is the abductor digiti minimi, 16 is the flexor digiti minimi, 17 is the flexor retinaculum, 18 is the superficial palmar arch, 19 is the common palmar digital artery, and 20 is the lumbricals. The flexor carpi radialis is the main flexor of the wrist, along with the flexor carpi ulnaris and the palmaris longus, which is absent in 15% of the population. They insert at the base of the third metacarpal, the base of the fifth metacarpal, and the palmar fascia, respectively. The FCU is primarily an ulnar deviator. The 8 digital flexors are divided in superficial and deep groups. Along with the flexor pollicis longus, which inserts at the thumb distal phalanx, they pass through the carpal tunnel to provide flexion at the interphalangeal joints. At the palm, the flexor digitorum superficialis tendon lies volar to the profundus tendon. It then splits at the level of the proximal phalanx and reunites dorsal to the profundus tendon to insert in the middle phalanx. The flexor digitorum profundus perforates the superficialis tendon to insert at the distal phalanx. The relationship of flexor tendons to the wrist joint, metacarpophalangeal joint, and interphalangeal joint is maintained by a retinacular or pulley system that prevents the bowstringing effect. The intrinsic muscles are situated totally within the hand. They are divided into 4 groups: the thenar, hypothenar, lumbrical, and interossei muscles. The thenar group consists of the abductor pollicis brevis, flexor pollicis brevis, opponens pollicis, and adductor pollicis muscles. All are innervated by the median nerve, except for the adductor pollicis and deep head of the flexor pollicis brevis, which are innervated by the ulnar nerve. They originate from the flexor retinaculum and carpal bones and insert at the thumb's proximal phalanx. The hypothenar group consists of the palmaris brevis, abductor digiti minimi, flexor digiti minimi, and opponens digiti minimi. They are all innervated by the ulnar nerve. This group of muscles originates at the flexor retinaculum and carpal bones and inserts at the base of the proximal phalanx of the small finger. The interossei group consists of 3 volar and 4 dorsal muscles, which are all innervated by the ulnar nerve. They originate at the metacarpals and form the lateral bands with the lumbricals. The dorsal interossei abduct the fingers, whereas the volar interossei adduct the fingers to the hand axis. The wrist joint is a complex, multiarticulated joint that allows wide range of motion in flexion, extension, circumduction, radial deviation, and ulnar deviation. The distal radioulnar joint allows pronation and supination of the hand as the radius rotates around the ulna. The radiocarpal joint includes the proximal carpal bones and the distal radius. The proximal row of carpals articulates with the radius and ulna to provide extension, flexion, ulnar deviation, and radial deviation. This joint is supported by an extrinsic set of strong palmar ligaments that arise from the radius and ulna. Dorsally, it is supported by the dorsal intercarpal ligament between the scaphoid and triquetrum and by the dorsal radiocarpal ligament. At the intercarpal joints, motion between carpal bones is very restricted. These joints are supported by strong intrinsic ligaments. The 2 most important ones are the scapholunate ligament and the lunotriquetral ligament. Disruption of either one can result in wrist instability. The 3 Gilula lines have been described to represent the smooth contour of a greater arc formed by the proximal carpal bones and a lesser arc formed by the distal carpal bones in normal anatomy. All 4 distal carpal bones articulate with the metacarpals at the carpometacarpal (CMC) joints. The second and third CMC joints form a fixed unit, while the first CMC forms the most mobile joint. At the metacarpophalangeal joints, lateral motion is limited by the collateral ligaments, which are actually lateral oblique in position, rather than true lateral. This arrangement and the shape of the metacarpal head allow the ligaments to be tight when the joint is flexed and loose when extended (ie, cam effect). The volar plate is part of the joint capsule that attaches only to the proximal phalanx, allowing hyperextension. The volar plate is the site of insertion for the intermetacarpal ligaments. These ligaments restrict the separation of the metacarpal heads. At the interphalangeal joints, extension is limited by the volar plate, which attaches to the phalanges at each side of the joint. Radial and ulnar motion is restricted by collateral ligaments, which remain tight through their whole range of motion. Knowledge of these configurations is of great importance when splinting a hand in order to avoid joint contractures. The superficial palmar arch lies directly deep to the palmar fascia. It gives rise to the volar common digital arteries and multiple branches to intrinsic muscles and skin. Distal in the palm, the common digital arteries bifurcate into the proper digital arteries. In the palm, the arteries lie volar to the corresponding nerves, a relation that is reversed in the digits. At the digits, the neurovascular bundle always lies volar to the ligament of Cleland. This pattern gives protection to the bundle and can serve as a guide for their surgical dissection. The deep palmar arch lies at the base of the metacarpals deep to the flexor tendons. It is the major blood supply to the thumb and radial half of the index finger by the first metacarpal artery. After giving its branch to the index finger, it is called the princeps pollicis. The dorsal arteries originate proximally from the posterior interosseous artery and a dorsal perforating branch of the anterior interosseous artery. Dorsal metacarpal arteries arise from a dorsal carpal arch formed by the previously mentioned arteries and are the source of multiple local hand flaps (dorsal metacarpal artery flaps). These dorsal metacarpal arteries are found more reliably for the first and second metacarpals then for the third and fourth. Common digital arteries arise from the superficial palmar arch to form proper digital arteries at the webs. The palmar aspect of the digits receives arterial flow through these proper digital arteries. The dorsum of each digit, distal to the proximal interphalangeal joint, is vascularized by dorsal branches of the proper digital arteries. Veins generally follow the deep arterial system as venae comitantes. A superficial venous system also exists at the dorsum of the hand and contributes to the cephalic and basilic vein in the upper extremity. The pulley system is critical to flexion of the finger. The retinacular system for each of the fingers contains 5 annular pulleys and 4 cruciate pulleys. The thumb has 2 annular pulleys and 1 oblique pulley. In the finger, the second and fourth annular pulleys (A2, A4) are critical pulleys. The oblique pulley is the critical pulley in the thumb. Deficiency of the pulley system can result in less active flexion of the digit for a certain tendon excursion. If the critical pulleys are missing as a result of injury, the moment arm of the flexor tendon–to–bone relationship is increased, resulting in the need for more tendon excursion to flex the finger. Zancolli E, Cozzi EP. Atlas of Surgical Anatomy of the Hand. New York: Churchill Livingstone; 1992. Dickson JK, Morris G, Heron M. The importance of hand anatomy in the accident and emergency department: assessment of hand anatomy knowledge in doctors in training. J Hand Surg Eur Vol. 2009 Oct. 34(5):682-4. [Medline]. Lister G. Injury. Lister's The Hand: Diagnosis and Treatment. 4th ed. Churchill Livingstone: Edinburgh, Scotland; 1999. 18. Vargas A, Chiapas-Gasca K, Hernández-Díaz C, Canoso JJ, Saavedra MÁ, Navarro-Zarza JE, et al. Clinical anatomy of the hand. Reumatol Clin. 2012 Dec-2013 Jan. 8 Suppl 2:25-32. [Medline]. Lee SW, Ng ZY, Fogg QA. Three-dimensional analysis of the palmar plate and collateral ligaments at the proximal interphalangeal joint. J Hand Surg Eur Vol. 2013 Jun 5. [Medline]. Olubaniyi BO, Bhatnagar G, Vardhanabhuti V, Brown SE, Gafoor A, Suresh PS. Comprehensive musculoskeletal sonographic evaluation of the hand and wrist. J Ultrasound Med. 2013 Jun. 32(6):901-14. [Medline]. Engineer NJ, Hazani R, Wilhelmi BJ. Variations in the anatomy of the third common digital nerve and landmarks to avoid injury to the third common digital nerve with carpal tunnel release. Eplasty. Oct 8 2008. 8:e51. [Full Text]. Sahin B, Seelig LL. Arterial, neural and muscular variations in the upper limbs of a single cadaver. Surg Radiol Anat. 2000. 22(5-6):305-8. [Medline]. von Schroeder HP, Botte MJ. Anatomy and functional significance of the long extensors to the fingers and thumb. Clin Orthop Relat Res. 2001 Feb. (383):74-83. [Medline]. Windisch G. The fourth lumbrical muscle in the hand: a variation of insertion on the fifth finger. Surg Radiol Anat. 2000. 22(3-4):213-5. [Medline]. 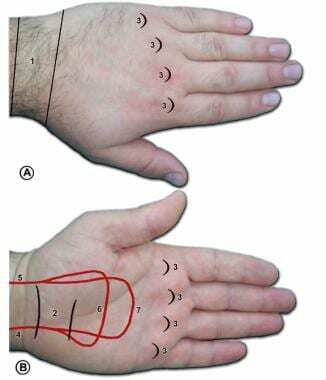 Bataineh ZM, Habbal O, Moqattash ST. Variations in the superficial palmar arch of the hand. Ital J Anat Embryol. 2009 Jan-Mar. 114(1):11-20. [Medline]. Gellman H, Botte MJ, Shankwiler J, Gelberman RH. Arterial patterns of the deep and superficial palmar arches. Clin Orthop Relat Res. 2001 Feb. (383):41-6. [Medline]. Hazani R, Engneer R, Zeineh LL, Wilhelmi BJ. Assessment of the distal extent of the A1 pulley release: a new technique. Eplasty. Aug 22 2008. 8:e44. [Full Text]. The authors and editors gratefully acknowledge the contributions of previous author Jorge I de la Torre, MD, FACS, to the development and writing of this article.